1999 MAC-T, Designed by Bob McTavish 6 ft 5 1/2"
Expoxy shell on foam blank, stringer ?, FCS Fin plugs, rubber deck patch and rails, adhesive decals, centre legrope plug. MAC-T Red and blue adhesive rubber oval on nose Left, top. 1. MAC-T Red, black and white oval, plastic adhesive on nose. 2. 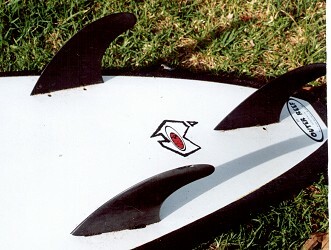 MAC-T Red, black and white oval in map of Australia, plastic adhesive foreward of centre fin. 2. BY OUTER REEF AUSTRALIA. MAC-T Black and white oval plastic adhesive at pod..
Bottom: .White with black rail lap. Dimensions and photographs 1st December 2004.